We’re proud to offer what is fast becoming renowned as the industries finest martial arts licensing, verification & certification services for martial arts, combat & self defence instructors and clubs. Our martial arts instructor certification and student licensing is well known as the professional, checkable and premium option for instructors serious about what they do. Stunningly designed, modern and linked to a national database that can be freely checked by anybody, anywhere 24/7, we’re leading the way for a modern martial arts and combat industry. Beautiful & professional instructor, coach & sensei documentation that’s checkable in live time from anywhere in the world. Gain recognition and certification for your club as a whole entity, including a number of instructors and trainee instructors. Member to member student insurance, licensing, grade recognition, student resources at some of the industry’s best prices. Ensure your credentials, grades and essential checks are ratified & recognised on our 24/7 live systems and checkable databases. Enjoy our leading syllabus licensing service, allowing you to gain recognition for your teaching techniques & syllabuses. Transfer in martial arts grades or martial arts qualifications gained under old or now non-recognised associations & NGBs. Vocationally grade for a number of dan grades in a range of styles & enjoy internationally recognised certification and grades in return. Access DBS check facilities to ensure you’re fully checked & ready to work with kids and vulnerable adults. Access recognised first aid training courses designed to help you keep your class safe & satisfy professional criteria. Get help protecting the most vulnerable members within your club with advice, guidance & training. Access national frameworks designed to keep gradings fair and positive. Backed by our organisation nationally. All of our instructor insurance policies are combined with our world-class martial arts association membership. That means not only will you be able to rest assured that your martial arts instructor insurance is managed by a truly professional, non-greedy organisation that really understands what you need cover for, but you’ll also be able to enjoy internationally recognised membership to a leading martial arts association, including access to a range of services, licensing and insurances to help you run your club better. 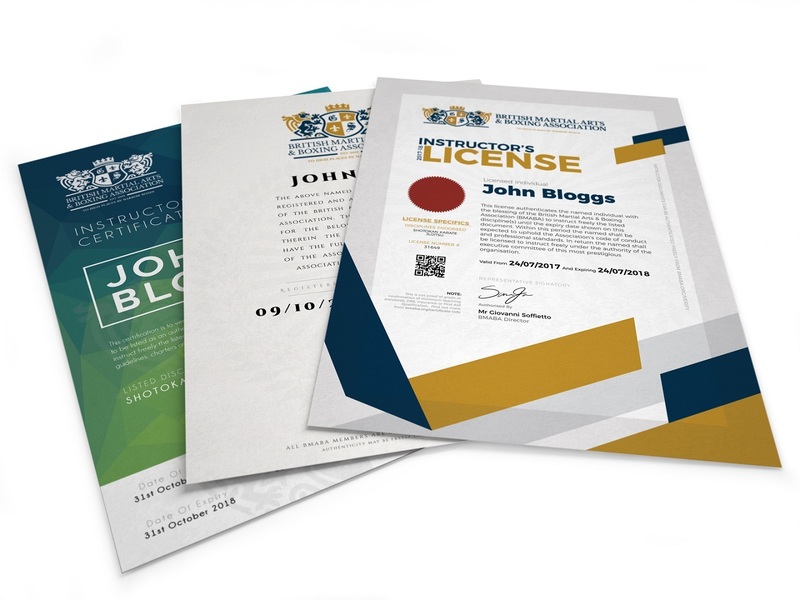 Our professional, checkable & modern martial arts instructor licenses & certification are helping honest instructors get ahead of the McDojos and cowboys by offering a truly verified professional document to represent their teaching. We’re independent, politics free & multi-styled and can license multiple styles under a single document. 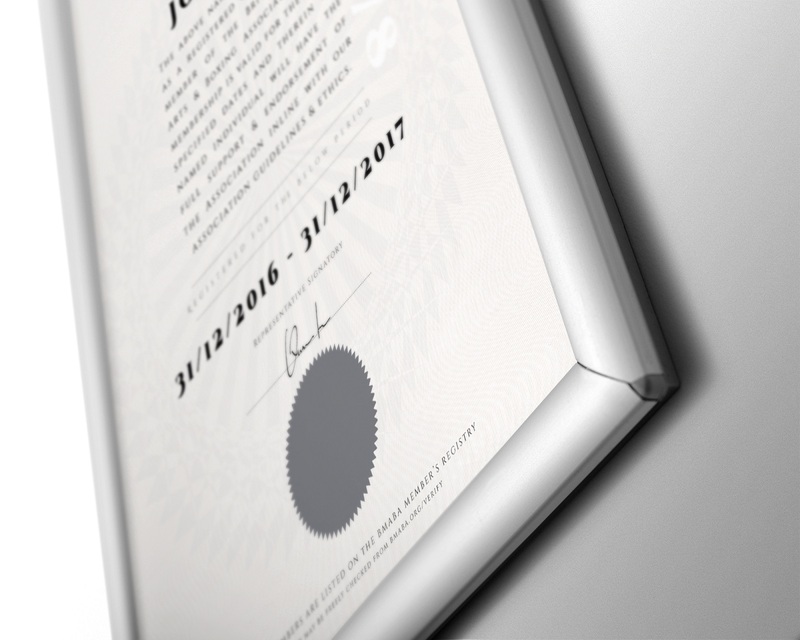 Times are changing and uncheckable, unprofessional or non-indexed certificates are open to scrutiny. If an insurer, governing body, council, venue, parent or student can’t easily and conveniently check a document’s validity you could lose out. 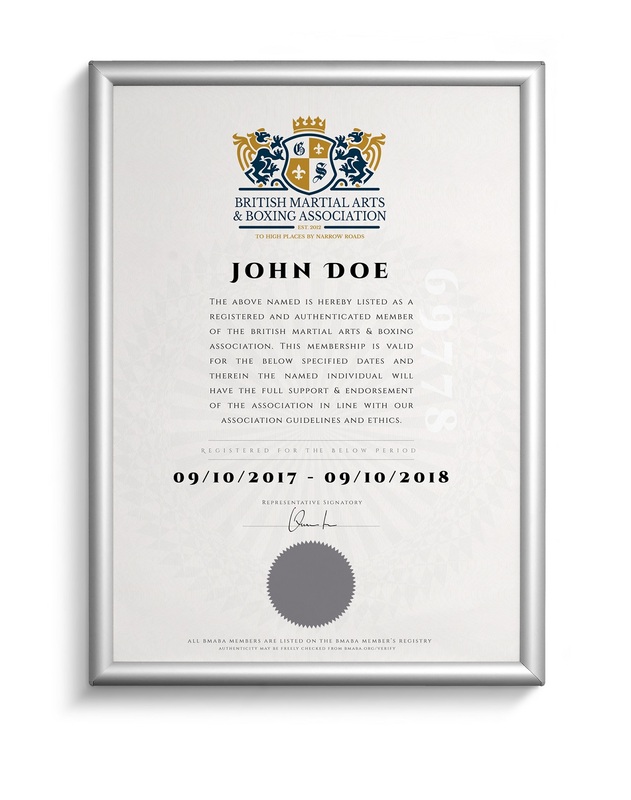 British Martial Arts & Boxing Association issued martial arts licensing is always checkable and referenced, meaning you can scan the QR code on the document or visit our online verification centre and search by instructor name, certificate number or instructor number. If you’re an honest, hard working instructor you’ll know how frustrating it can be when McDojos can trump you with a superior marketing budget. Likewise, we know how frustrating it is having no more weight to your certification than the ‘glass screen warriors’ that call themselves yodans. Our online verification system instantly authenticates any and all documentation in live time, so you can sure your certification will back you up when you need it to most. Our verification service is included free of charge with all memberships. We’re keen to help as many instructors as possible reach the high standards we know make martial arts what they are. Completely independent to run your club your way. A politics free governing body founded by instructors for instructors. 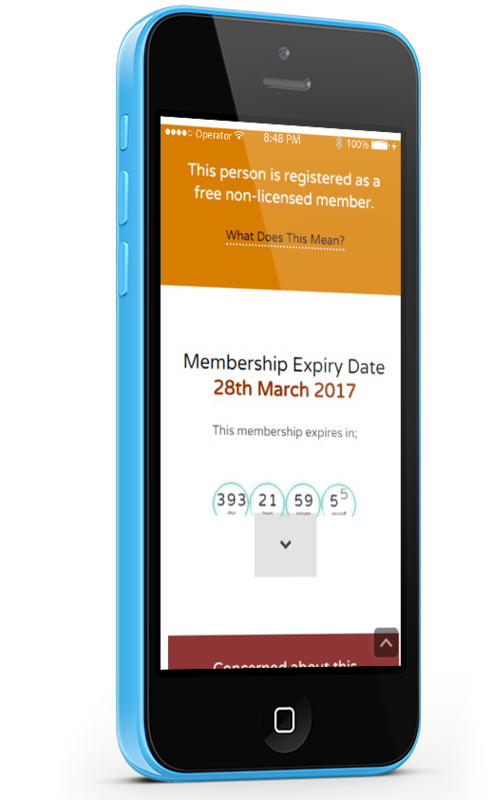 Access to leading licensing, insurance and resources to help your club grow. Cutting edge technology designed to help your club grow in the 21st century. Support and services from web hosting and printing through to certificates and documents. Confidential professional support throughout the course of your membership. Everything you and your club will ever need. One membership.